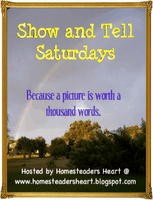 It's Show and Tell Saturday hosted by my friend Kim at Homesteader's Heart! The theme today is your favorite vacation. I've posted pictures from a couple of trips before - our Yellowstone Trip last summer and some pics from Bryce Canyon from the summer before. Bryce Canyon was part of a big trip we took that included the Grand Canyon and some other places. 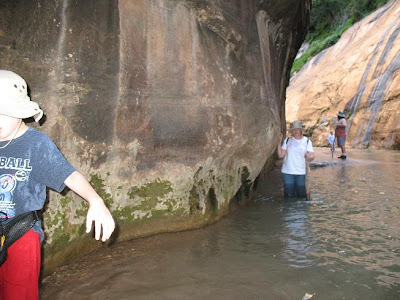 Though the Grand Canyon was awesome and amazing, our favorite on that trip was Zion National Park because we got to experience being in the bottom of a canyon and hike up a riverbed! 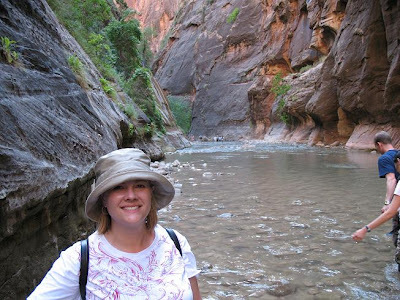 After hiking along a trail called Riverside Walk, we came to this spot where the trail ends and you have the option of hiking up the canyon, wading through the Virgin River. 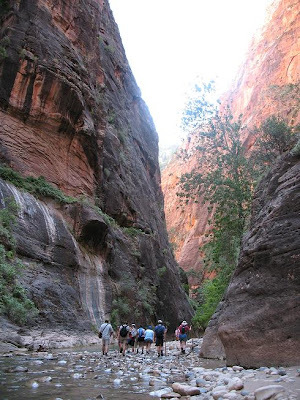 At that point it's called The Narrows. Some times the river has more water and sometimes is nearly dry. There was definitely some water, but not so much that we couldn't wade through. 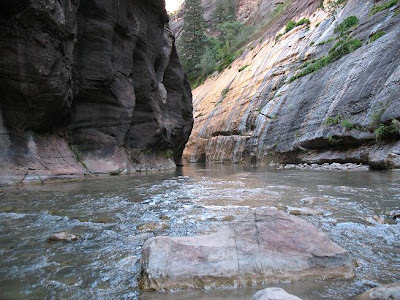 There are signs telling you that you will proceed at your own risk - if there is a sudden thunderstorm, there will be a flash flood down the narrow canyon. Yikes! But we saw lots of people going back and forth, no rain forecasted, and a completely clear blue sky without a single cloud - so we decided to go for it! There were plenty of walking sticks leaned up against the rocks for us to use - take one to use and put it back when you're done! 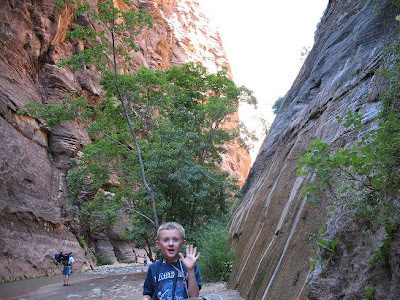 Here is my son as we were partway up the canyon. It was tough wading through all that water on slippery rocks, but I'm glad I did it! 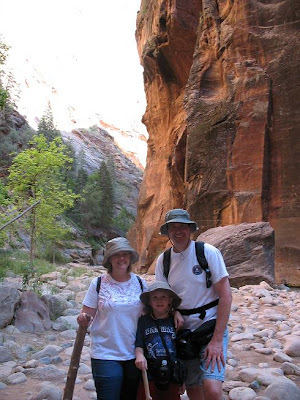 This is my favorite pic and was probably taken after an hour of going through the canyon. We finally realized that we wouldn't make it all the way (at least not before dark) to the narrowest part and had to start heading back. 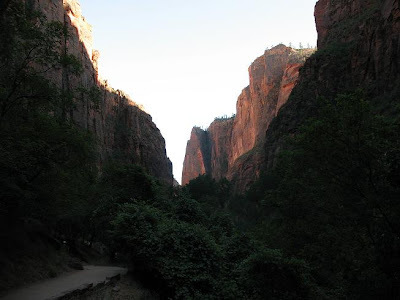 We talked to people that had walked most of the way through the canyon - took them about 8 hrs at least in and out - and heard that at it's narrowest you could stretch out your arms and almost touch both sides of the canyon! Here we are on the way back - had to find the most shallow spots. Sometimes that meant hugging the wall. A spot where you could see the water running. A look back at the canyon after we left and were on the trail back out. 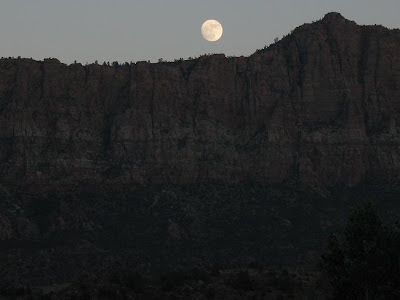 And this is a cool pic of the moon that hubby took after we had driven out of the park not too long after. That was such a great experience and it's always wonderful to see God's amazing creation! This hike was my son's favorite part of the whole trip. Hope you enjoyed this little trip with us! Oh wow! I did enjoy it! That sounds like so much fun! And I love the pictures! Don't you just love family vacations and the memories made?!?! Take care my friend! Hope you are having a great weekend! That sounds like so much fun. And I just adore your little hat you were wearing. Very modest head covering my friend. LOL. 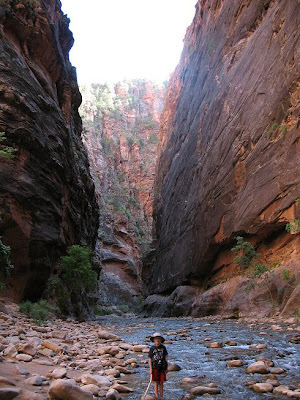 Big CAnyon size hugs to you! Your pictures are beautiful! It sounds like it was a wonderful vacation. What a cool trip. I hope I get to do this with my family one day. A little early yet... mine are 2 and 6 right now, but I'm putting it on the list for a few years from now!